A couple of days ago I was on the hunt for a long-sleeved white shirtdress, one that was smart enough to wear to work, but could also be dressed down with a pair of jeans. I ended up finding one in H&M for £19.99. The sleeves are 3/4 length, so it's not perfect, but you still need to wear a long sleeve cotton top underneath anyway because it's see-through. I couldn't find the exact picture, but it's close to the ones shown, has a removable tie-belt at the waist and comes just above the knee. Green hijab £8.95, The Hijab Shop; peacock bangle £9, Dorothy Perkins; blue hijab £8.95, The Hijab Shop; multi-strand necklace £20, Monsoon. btw, do visit my friends blog... she has a boutique here in malaysia selling nice hijab... she also does our Majesty The Queen's hijab... http://inaali.blogspot.com.. The LBD is a staple in a hijabi's wardrobe too! 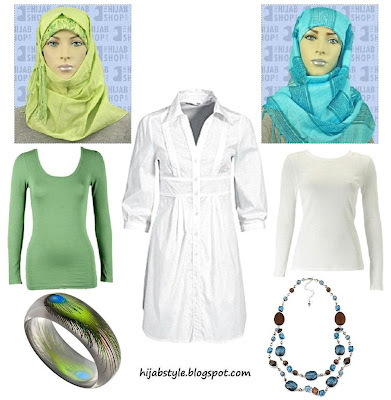 Like the white shirtdress, there are so many ways to wear it and accessorise, works with jeans, smart trousers, and all colours of hijab, jewellery, cardigan, long sleeved Tshirt etc. I love those shirt dresses - I think I may have picked up the same one from H&M - does yours have a tie-up on the sleeve? I got it at a discount and its perfect for the summer! alhumdulillah i have 2 nice white shirts from primark and are very long down to my thighs. its looks very nice and cool in the summer and looks crisp and clean as well. would just like to say also jazakallah for your blog, as on sunday i am doing my nikkah and alhumdulillah have found some really good ideas for my hijab, all i need now is to practice lol. I really like the long shirts.... soo a must have..
Um where are the long sleeve tops from?? because i have been looking for some recently in like different colours but cheap, i know ive heard primark does some - but do they still have them?? I got a really nice long full sleeved shirt from M2K a few months ago. I don't know if they still have it, but thought I'd suggest it anyway. Couldn't agree with you more! I got a white dress from warehouse a month or so ago and every time I wear it I make it look different. It really is the most versatile item of clothing I own! I've worn it with a waistcoat, different types of cardigans, over jeans, over trousers, with different styles of belts. Now considering wearing it over a skirt. I love it. My only worry is I’m wearing it way too often!! Was looking for a picture of my dress and came across some more. Mine is the first dress. The picture doesn't do it justice. I like the cut its not for fitting so I can wear it with just a long sleeved top underneath. Or wear a belt with a cardigan on top. n.i., nice to see you around again :) thanks for the link, will check it out inshallah! Anon, I agree a black tunic/shirtdress is a staple too, but more for the winter. I also find that there are more colours that work better with white than black. Aalya, nope mine has sleeves like the one in the pic. I checked out the sale racks in H&M and couldn't find anything! Anon 2, the long sleeve tops are just stock photos. I'm not sure if Primark still has them, I got mine quite a while ago, but you could still check. hum, I've not heard of M2K, do they have an online store?